Our best soundtrack tournament continues with two new titles. 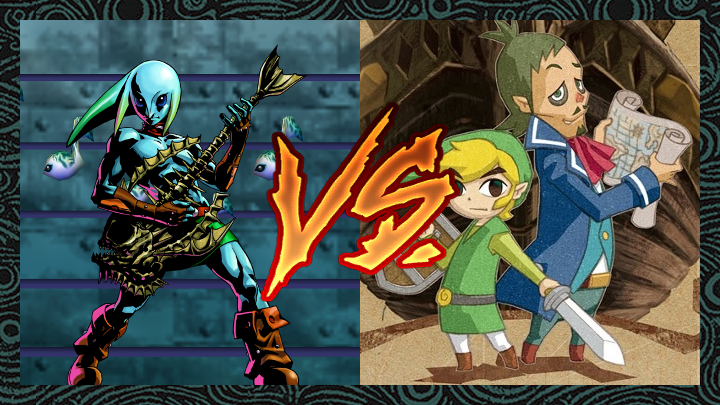 As The Adventure of Link and Oracle of Seasons duke it out in yesterday’s poll, Majora’s Mask and Phantom Hourglass step into the fray. After the groundbreaking success of Ocarina of Time, and the game’s equally groundbreaking soundtrack, the Zelda set out to develop a smaller, more intimate experience with their next game, Majora’s Mask. But the smaller scale of Link’s second adventure on the Nintendo 64 didn’t mean its soundtrack suffered at all. In fact, the game’s music was able to accomplish levels of emotion we hadn’t seen before in Zelda. Tracks like the Song of Healing, Oath to Order, and Skull Kid’s theme were somber, impactful, and dramatically unrelenting. These songs had layers, and that’s why fans continue to sing their praises. Building on the template set forth by The Wind Waker, Phantom Hourglass offered a whimsical and adventurous tone with its soundtrack. Traveling the seas of Ocean King was just as exciting, perhaps even more so, as travelling the Great Sea in Link’s first voyage across the waves. Phantom Hourglass also introduced to the salty treasure hunter Linebeck, who has, in my opinion, one of the best character themes in the entire series. Not many theme songs capture the essence of a character quite like that of Linebeck, and the seadog’s comically self-serious tune has helped him to resonate with fans long after his debut. Which Game Has the Best Soundtrack? We will post a new Round 1 voting page each day, Monday through Friday. Every Saturday, we will post a wrap-up article explaining the results of the prior week. Once voting pages for all Round 1 bouts have been posted, there will be a one-week break before Round 2 begins.